Smart Wheel Pedal Assist Takes Some Strain Off Your Morning Commute | OhGizmo! By David Ponce on 10/16/13 • Leave a comment! This isn’t the first battery powered pedal assist on the market, but we like some of the features on the FlyKly Smart Wheel. It bolts on easily to just about any bike frame and adds roughly 9 lbs. of extra weight. 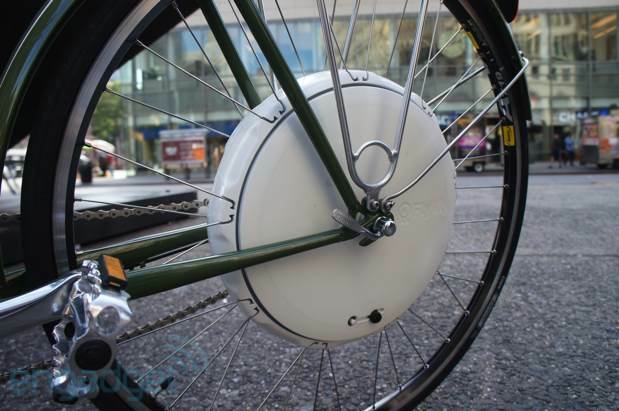 In exchange for the extra mass, you get an electric motor that gets you up to, and keeps you at your desired cruising speed (20mph max), as soon as you start pedalling. Just set your target speed on the related application, and it does the rest automatically. When it senses you breaking, it slows down as well, without you having to explicitly tell it to slow down. With a range of 30 miles, you should have enough for a daily round trip, and if not, maybe you shouldn’t be commuting with a bike. Finally, it has an application-toggled lock option that prevents the back wheel from spinning and adds a layer of security should your bike get stolen. It even has a GPS module if the enterprising thief decides to carry it away, allowing you to locate it from a distance. Considering all the features on the FlyKly Smart Wheel, we’re not too shocked to see the $550 price tag, which is really just a pledge for the still unfunded Kickstarter campaign.